If you’ve never seen a Rocky film, this double still works surprisingly well in isolation. 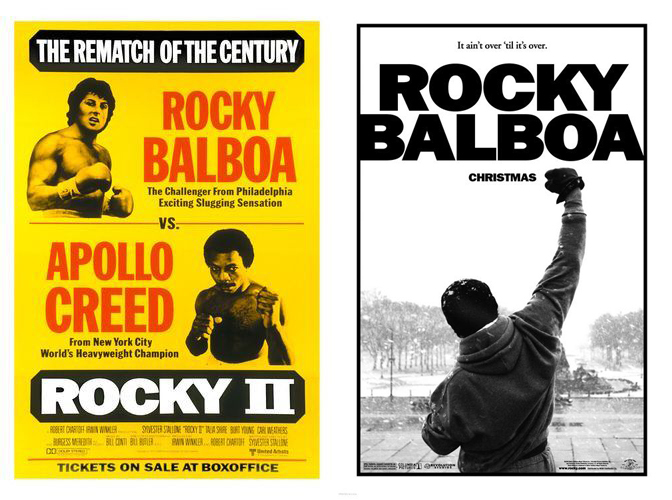 Rocky II, like nearly all the Rocky films, kicks off with a Previously On montage, so you get a good idea of what you missed in the previous film. Stallone wrote all the Rocky films, but II was his first entry in the franchise as director, and he doesn’t venture too far from the style that John G Avildsen established in the original. There are some differences, and these differences highlight Stallone’s interests: he’s clearly influenced by vérité of New Hollywood, and yet these are still films about ordinary people becoming extraordinary. 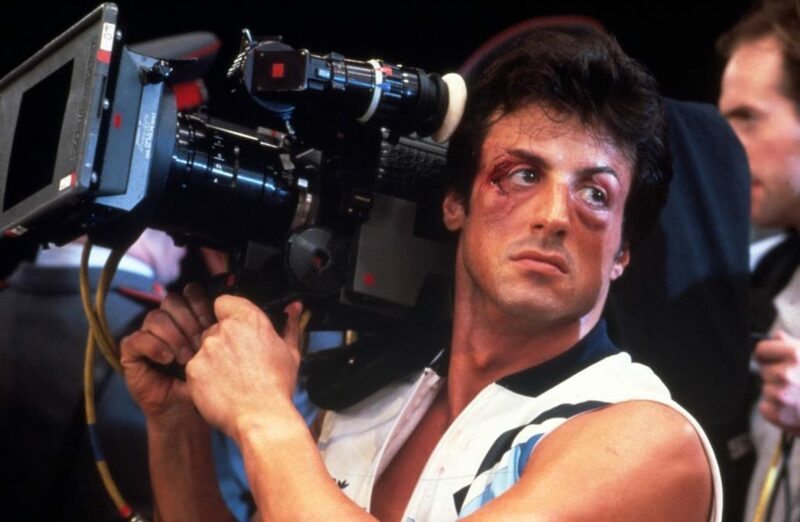 Throughout the big fight, Stallone lowers the camera so the fighters go from humans to heroes, towering above us. It’s deft work from Stallone so early in his career. When you’re done with Rocky II, put on Rocky Balboa. This was the big comeback for both Stallone and his character, 16 years after the series had seemingly wrapped up. For a film that’s all about a boxer from the ’70s coming up against a boxer in the ’00s, it has the feel of a director from the ’70s trying to hold onto what worked once before in a Hollywood that’s long-since moved on to greener pastures. But the film works; Rocky’s still got it, and so does Stallone. Substitutions: If you can’t get or have already seen Rocky II, check out Paradise Alley (1978). This was the first film Stallone ever wrote, and after the phenomenal success of the first Rocky, he was given the chance to direct it. The story of a low-rent hustler who convinces his brother to become a wrestler so they can make some fast cash is a pretty fascinating entry in the Stallone canon. If you can’t get or have already seen Rocky Balboa, check out Rambo (2008). In a two-year period, Stallone revisited his two most iconic characters with unsentimental postscripts. The lack of Roman numerals suggests that, as with Rocky Balboa, this was designed to be the final entry. There’s not as much solemn introspection in Rambo, but that makes it all the more profound: Rocky’s world may be long gone, but John Rambo’s remains. The conflicts of the past take on new yet similar guises, and those who try to help are quickly forgotten. But most importantly, it’s crazy violent yo! The Hidden Gem: Want to see something off the beaten path, a title rarely mentioned when people talk about the films of Sylvester Stallone? Then you should probably check out Staying Alive (1983). Chances are you’ve forgotten that Stallone directed the sequel to Saturday Night Fever (1977) – yeah, the BeeGees film with John Travolta – because it’s one of those facts that seems impossible to grasp onto, regardless of how many times you’ve heard it or even seen the film itself. But it happened. And if you want to see Stallone directing something that doesn’t involve high-stakes combat sports or the graphic shooting of faceless bad guys, this is something you really need to see. The next episode of Hell Is For Hyphenates, featuring Michael Ian Black talking the films of Sylvester Stallone, will be released on 30 September 2017. This entry was posted in blogs and tagged cheat sheet, michael ian black, paradise alley, rambo, rocky balboa, rocky ii, staying alive, sylvester stallone on September 22, 2017 by The Hyphenates.